Stephen Robert Irwin was born on February 22, 1962 in Australia. In 1970, Irwin moved to Queensland with his parents. His father was a herpetologist and wildlife expert, and his mother was a wildlife rehabilitator. Both of Irwin's parents worked in the Queensland Reptile and Fauna Park. Steve would help to do feeding and maintenance jobs around the park. He began handling crocodiles at the age of 9, and he wrestled his first crocodile that year. 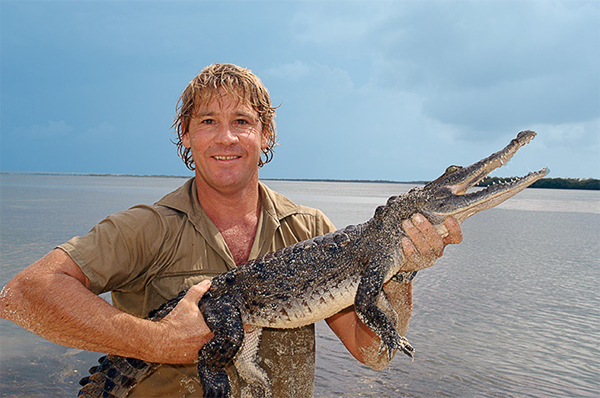 Irwin volunteered for Queensland's East coast Crocodile Management program, and captured over 100 crocodiles. In 1991, Irwin took over as the manager of the Reptile and Fauna Park and renamed it Australia Zoo the following year. In 1991, Terri Raines, a naturalist from Eugene, Oregon, was visiting wildlife rehabilitation facilitis in Australia, and met Irwin while visiting the zoo. Four months later, the couple was engaged, getting married in June on 1992. The Irwins' honeymoon consisted of trapping crocodiles together. Film footage of their honeymoon was taken by John Stainton. This footage became the first episode of the Crocodile Hunter, which came out in Australia in 1996, and into North American television by 1997. The Crocodile Hunter was a massive success, reaching 130 countries and 500 million people. As the show progressed, the cast included Steve, Terri, their dog Sui, and their children: Bindi Sue and Bob Irwin. The show continued until 2006, though Irwin continued to appear in other shows, including Croc Files and The Crocodile Hunter Diaries. Irwin continued to appear on television. He was in several episodes of The Tonight Show with Jay Leno. He also had cameos in Dr. Dolittle 2, Happy Feet, and The Wiggles. In 2002, he starred in the movie The Crocodile Hunter: Collision Course. He also was part of the Australian Quarantine and Inspection Service's media campaign to promote Australian customs requirements. 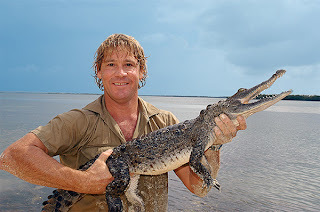 Irwin also remained active in conservation, founding the Steve Irwin Conservation Foundation, an independent charity that was renamed Wildlife Warriors Worldwide. He also helped to found the International Crocodile Rescue, the Lyn Irwin Memorial fund, and the Iron Bark Station Wildlife Rehabilitation Facility. In November of 2003, Irwin was in Baja California filming a documentary when two scuba divers were reported missing. Irwin suspended the filming and helped in the search for the missing people, saving one person and finding the body of the other. While filming a documentary on ocean creatures, Irwin was snorkeling at the Great Barrier Reef when a ray turned and attacked Steve, stabbing Steve with the spine of its tail. Irwin died shortly afterwards. Steve Irwin makes our list because of his personality. He was able to capture the attention of the entire world with his show and was able to put that attention to good use. Irwin is also probably one of the most important conservationists in the history of the world. Also, Irwin had two species of animals and a gorilla named after him. Steve Irwin changed the world we live in and is remembered for his contributions to it.